A couple of Januarys ago, I spent a nice sunny day in my outdoor workshop doing some carpentry. I was helping a friend build a fancy Adirondack chair for her own patio. After we finished our work, she insisted on paying me with a huge pan of some delicious homemade dinner, and a box of wine. The food was a major score, since this girl can cook like a demon. But the box of wine turned out to be even more profitable, because she had opened my eyes to a whole new world of wine buying that has saved me hundreds of dollars since then. And now I am pleased to pass those profits on to you. The wine she brought to me was called a “Bota Box”. As you can see from the picture, it comes in a stylish and hipster-friendly box made of unbleached recycled cardboard. The most interesting part of the box is that picture of FOUR wine bottles down in the corner. That’s right – one of these boxes, which is shorter and easier to carry than a single wine bottle, contains an equal amount of the good stuff to four 750mL bottles. The benefits are many, and there are no drawbacks. This Bota Box wine, as well as several of its competitors like my current favorite “Banrock Station”, is some really good stuff. The quality is comparable to what you’d find in $10-$15-per-bottle wine in my own area, which translates to what Antimustachians would pay about $35-45 per bottle for in a restaurant. I’m not a wine snob, as that is a highly unprofitable affliction to develop. But I can still appreciate the difference between the very cheapest bottles and the midrange stuff most of us buy. (As you might expect, I have also experimented in the ultra-cheap zone, but unfortunately the sheer badness at that end of the spectrum forced to move back up a little). 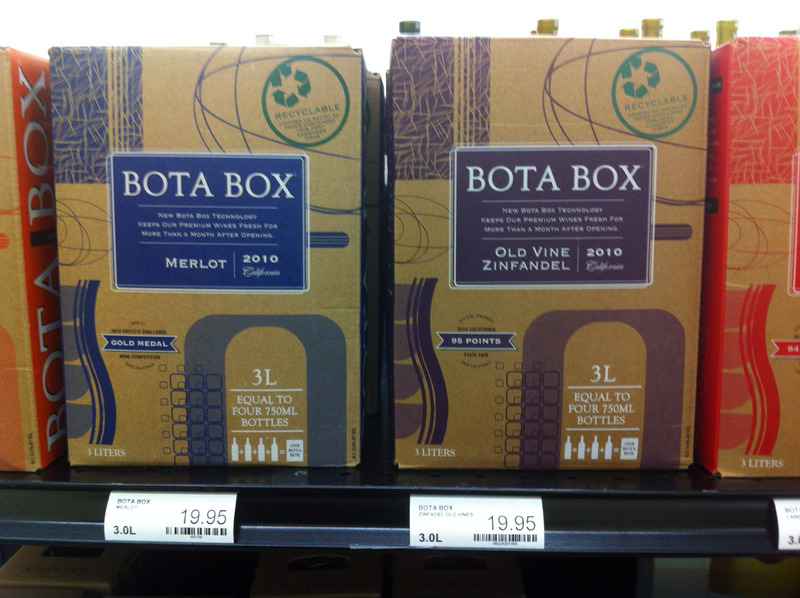 But the Bota Box costs about $20 per box, which translates to $5/bottle. Banrock has been on sale in my area recently, so I picked up a couple boxes at $13 each (regular price $18, which means I am getting great wine at $3.25/bottle*. This is a significant find for party people. I know of many young couples who consume a bottle a week between them at $10 a shot. Using my usual rule of compounding (multiply a weekly expense by 752), this burns up $7520 every ten years. Switching to the boxes at my current sale price saves them $5076 of that amount. In other words, you could cut your wine bill by almost 70%, even without having to cut down your drinking! Having the wine in a box also adds novelty to a party. You set it up on a shelf, and when you’re ready for a refill you push the red button and watch wine rapidly flow into your glass. There are no downer moments when you realize the bottle is empty after just one round, and there is no forced extra drinking to “Kill the Bottle”. It’s like having great red wine permanently on tap. The other benefits are practical as well: These boxes stack efficiently and don’t have the extra weight of glass, so they are ideal for road and camping trips. You can whip one out even in a public park where glass is prohibited. The container lasts forever when left closed, and still over a month at room temperature after opening, because the wine is stored in a vacuum-packed foil bag so it is never exposed to oxygen. And finally you save a good percentage of the natural resources normally used to melt, form, ship, and recycle four glass bottles. At the end of your drinking, you’re left with an ounce or two of recyclable cardboard and a very tiny quantity of collapsible plastic. It has been over a year since my friend showed me this new trick, and I haven’t felt the need to buy a single glass bottle of wine since then. I hope it enhances your weekends as much as it has mine! * Only people with access to Trader Joe’s can beat this level of value, and alas, TJ’s does not yet exist in Colorado. Also, we haven’t fixed our liquor laws to allow alcohol sales in standard food stores yet. Biggest drawback of the state, in my opinion. But at least there are still nice privately-owned liquor and wine stores everywhere. At least Colorado is not as backwards as Pennsylvania. We have to purchase wine and spirits from state run liquor stores which causes everything to be more expensive than in the surrounding states. We also can’t buy beer outside of a beer store (can only buy full cases) or a bar (inflated prices for 6 packs). That may have been true at one point, but while some things are more expensive, some things are less expensive. In fact, we have some extremely affordable items that go for hundreds more elsewhere because of our pricing rules (Pappy Van Winkle, when in stock, is a notable example). Having been down to Maryland at one place that arguably has the lowest liquor prices in the Mid-Atlantic, some things weren’t cheaper or were maybe only a dollar cheaper than in state stores. They’ve been aggressively expanding selection and trying to improve the state stores, and it’s definitely noticeable. In principle, I’m against a government monopoly on something like liquor and it’s not always advantageous, but I’d say it’s actually pretty decent in PA these days and it’s been improving (it would do even better if the legislature would pass the modernization bills already! ), especially considering that the state stores contribute about $500 million to state coffers and taxes would have to be raised to make up for that. Just my two cents as a policy wonk who follows this kind of stuff closely. Depending on one’s preference, the bags can be reused as a travel pillow or, if one if persistent and the cap is agreeable, emergency water storage (i.e. one drinks a few more glasses of the wine and would appreciate a considerable source of non-spillable water next to the bed). I’m a proponent of at two-use system. If I can use it once, I’d rather use it twice. Additionally, wine snobs might look down their noses at a wine box but it is the same wine that goes into bottles but with better packaging, more convenience and for less money. I have 2 very expensive wine bottles that I keep refilling with box wine. My wine snob friend has never noticed the difference. She thinks I spend a fortune on wine whenever she comes over. lol! LOL That’s a great idea! They are studies that prove that wine judges can’t give the same ratings for the same wines when they are asked to rate them a second time in a different order. And tasters’ evaluations of a wine’s quality are hugely swayed by bottle labels, so basically, there’s a lot of BS in the wine industry, so why pay more when nobody really notices in the end!? I’m so gonna do that boxed-wine-in-a-nice-bottle trick! I love this idea too, and am definitely going to try it. Keep an old bottle for show, but poor the cheap wine into a nice decanter and nobody will know the difference. This must be why people are willing to pay so much for premium coffee like Starbucks, because they are paying more the brain is tricked into thinking it’s higher quality and releases more pleasure hormones. Works just the opposite for me, the few times I have bought expensive coffee, it made me feel worse. Hey, gimme a break MMM. I’m just learning to accept screw top bottles. We love wine around here and enjoy it with most meals. During my business entertaining days I developed a taste for the good stuff. Money well spent in my book. Each can contains 4.5 bottles and has a cool tap. It is almost like a keg of wine! It retails for $34.99 per can, but you get $2 per can for bringing back the can and $2 per can when you buy 2 or more cans at a time. Therefore, the total cost to us is $30.99 per can. This comes out to $6.88 per bottle which is not as good as you are getting, but it is satisfying supporting a local vineyard. i am a big fan of pinot evil pinot noir in the box. lately it’s been on sale for $16 a box and it’s yummy, sometimes almost TOO yummy! there are also some not-bad wines called bandit, in juicebox-like packaging. i don’t drink a lot of white, but i do like their sauvignon blanc. Black Box, Cabernet Sauvignon, $18.99/box on sale. No bad after effects as well. 2nd Black Box Merlot and Cab. Black Box Malbec :-) Tested several boxes of Corbett Canyon Pinot Noir at $11.67 per box – had to declare it rot-gut. Too bad, price was right! Yes, Black Box is the way to go! $18 at Costco so about $4.50/bottle and tastes more like a $10 bottle which is perfect for most. I’m a recent convert to boxed wine. Just bought a Bota Box this week! Another great thing about boxed wine is you can have as little (or as much) as you want. There’s no pressure to drink it all before the bottle goes bad. Slapbag? Is this slapping the bag within the box, or opening the cardboard box, take out the bag, and squeeze out the last drop? The best wine (and beer) at the lowest price is what you make yourself. I’ll put my Cabernet and Merlot up against any winery’s, and the cost is about $3 a bottle (recycled many times) I won’t say my Irish Stout is better than Guiness but its as good. Google up any winemaking site and learn, I use Grapestompers. I wouldn’t say my Cabernet is better than the commercial brands—yet. However, it’s pretty damn close. My white wines are usually indistinguishable from the commercial wines. But you’re right to recommend the practice of making your own wine. Especially if we’re talking about saving money. “Kits” with the juice from pretty much any varietal can be purchased (in a cardboard box and plastic bag) for $60 to $200 depending on origin and quality. Each of those kits usually produce 30 bottles of wine (the glass kind that you can reuse over and over again). Decent corks are about $.25 a piece (I’m even starting to reuse screwcap bottles with surprising success). As BBaxter said, each bottle ends up costing considerably less than what you pay in the store. And if you switch to using fruits or honey, you might even save more money. I make a few batches of crabapple wine and a dandelion wine every year. People have no use for crabapples or dandelions, so they are easy to get for free. With both you just need a few pounds of sugar, some frozen juices, a variety of wine-making substances and a whole lot of patience. Making wine is easy and more people should give it a try. Be careful where you harvest dandelion. Weed killer stays in the earth for a long time, and is absorbed by surviving (adapting) plant life, and therefore you. Easy to grow superb organic ones even in a pot. As someone who is addicted to Banrock Station wines long before she moved to the US, but has only been able to find them in bottles here in the US, knowing that they are available in handy (and more cost effective) boxes here in the US now gives me more of a thrill than it should. During the whole blog post instead of reading/listening like I was supposed to, I was gloating internally and getting ready to brag about the TJ’s access and 2.50buck chuck. But then the footnote. Alas, you anticipate too much. Spoiling my fun. I just wish Jackie D would come in intravenous bottles. But agree Bota Box is high on the value ratio. One trick for the wine afficinados hosting a dinner is to start with 1 bottle of ‘the good stuff’ and then switch to the bulk. After 1 glass, no-one will really care too much! Bota boxes are awesome. Just don’t drink the whole box in a night. Trust me on this one. I drink the Trader Joe’s Pinot Grigio like nobody’s business. Parties at my apartment consist of me buying a case of it and telling everyone to “either drink 3-buck-Chuck or BYOB.” I recently bought some $4 wine at TJ’s because I feel like my friends are getting tired of me bringing the exact same wine to every dinner party I attend. Buying TJ’s wine makes me much less likely to get a $6 glass out at a restaurant, because for that price I could drink two bottles at home! I completely agree. Here in South Africa I buy 3 liter boxes of delicious regional wine for R75 (about 7.50 Euro, not sure about dollar). Great value! Also I enjoy it more knowing that I haven’t spent a fortune. Viva Le Two Buck Chuck! There’s a Trader Joe’s coming to Boulder, and word on the street is that it will be the one location (due to the stupid laws) that has the liquor license. Hi MMM, I included a Chardonnay Bota Box in my weekly grocery shopping cart this morning, at $15. I tried the wine and it’s a good choice for eating with a meal. Thank you for the recommendation. Ahh MMM you have discover what we here in Australia call the goon box. It is a favourite of Backpackers, Students and every other sort of cheap drunk. Usually retailing for between $10-$15. One of my favourite drinking games was “Goon of Fortune” Simply tie the bag to a rotating clothes line. all stand round and then spin it. Where ever the goon stops you drink. Another important feature is that it come with its own pillow. Just reinflate the bladder and you will have a pillow to rest your head on for what will be on hell of a hang over in the morning. Aldi–which is the cheap step-child (they are owned by the same company) to TGs has a nice Shiraz for $2.91 including taxes for 750ml. Really, after moving here, I had to switch to drinking wine and drinking cask wine at that. The taxes on booze are insane ($20 for a 6-pack of middle-grade beer, $30 for craft, $40 for a middle-grade bottle of liquor) so the only thing that’s even reasonably affordable thanks to industry protection interests is wine. The upside, if there is one, is that with as expensive as beer and wine are there really isn’t much of a premium for getting one in a pub. You’re going to be shaken by the ankles anyway, so why not get out of the house for a bit? HA! HA! Funny you shoud mention discount wine, I just found Smirnoff Vanilla Vodka, on sale for 10$ at my local grocery store and got all excited! My wife and I wife and I are suckers for Vanilla Vodka and Diet Orange Sunkist. We call it “the Alaskan Sunset” and it tastes heavenly! After all this talk about cheap Trader Joe’s Wine, I’m gonna have to go check out the 2$ bottle section. One benefit of living in California is that I have every option at my disposal! Wish I could have a few drinks at the Mustachian Bar, with my fellow Mustachians every now and again! Those boxes were popular in South Africa, where I grew up. My parents would give us the inserts to float around the pool on. Excellent! It never would have occurred to me that there were additional uses for those magic foil bags. I’m going to try inflating one with helium to see what kind of a stir it can cause around the house. I love that you just happen to have helium around the house. That’s one of the “benefits” of rental house ownership. For each tenant turnover, people leave behind stuff that I wouldn’t have bought myself, yet are not easy to give away. Weird cleaning supplies, packages of garbage bags, half-filled bottles of high-end tequila and half-filled tanks of helium from birthday parties. The helium is fun a few times a year, but not worth the storage space it takes up. UPDATE! I just tried blowing up an empty wine bag with helium. It fell gracelessly to the floor. I guess the weight of the spout makes the whole assembly too dense to float around. Luckily I was able to salvage the helium by breathing it into my lungs and teaching my son the squeaky helium voice trick, so it wasn’t a total waste. Having grown up on Long Island, NY most of my friends were Italian and every family made wine in their basements and after moving to the south very much missed the rustic homemade wine. I found a number of wine making kits available online and made a batch of from a kit called “Luna Rossa”, advertised as a “big fat red”. at the time the kit yielded 2 1/2 cases at roughly $2.60 a bottle. Being that you make your own beer, I assume you probably have all the equipment already. The bottles also make fantastic “mustachian” holiday gifts, especially when you print and add a “custom” label. Perhaps “Mister Money Mustache Merlot”? I have a bota box in my fridge right now! I bought it one day when I walked to the liquor store; but now that my bike is all fixed up, one of those would fit perfectly in my homemade pannier bags! Target also has their own line of boxed wines which aren’t bad. They have a smaller size box (equiv. to 2 bottles) for about $10. We like that because we aren’t daily wine drinkers, but we do like wine. The little box keeps the wine good for a month so we don’t have to drink more than we actually want for fear of spoilage. Have you ever looked into making you own wine? I know people that do that, and they are very happy with the results. I know that you make your own beer, so it would probably be fairly easy for you to transition to wine making as well. Thanks for the reminder – I’ll make some wine in the next brewing cycle and let you know how it turns out, from a cost/time/quality perspective. No, box wines are best consumed within six months (if unopened). They are made/matured for immediate consumption. Usually they contain more sulphur than the bottled equivalent. I like bottled wine since the variety is so much wider, although box wines are wildly popular here in Sweden. Even more important: We don’t have space for several boxes in our apartment and definitely not in our fridge – several, since different courses require different wines. If we don’t finish a bottle, we vacuum pump it. You can also freeze the leftovers for later cooking. At our state-monopoly stores (“Systembolaget”), a box saves $1-2 per bottle. Buying boxes would be a waste of wine for us. A foot note regarding price and quality: There is a per volume alcohol tax here in Sweden which means that the margin of benefit if very high if you move from $8 to $11 or so. Hmm.. I just checked my current box – it has a best before date of 13 months from now. But I wouldn’t worry too much even if it were six months, since I don’t have the self-discipline to make three litres last even that long. In countries like Canada and Sweden with high alcohol taxes, I highly advise the brew-your-own route. Grandpa Money Mustache gets his wine through a brew-your-own outlet which actually does a lot of the work for you in their premises, and even then it comes out to only $3/bottle. And his wine is great as well. According to Lifehacker, boxed wine will spoil faster than bottled wine because the insert is porous to oxygen. http://lifehacker.com/5969692/boxed-wine-spoils-faster-than-bottled-wine-so-keep-it-cold. We’ve had wine pouring that we brought back from Italy for over 4 months that is still fine without refrigeration. Boxed wine is the way to go for bringing back wine from overseas. Less than $2 per liter with taxes, and travels much better than glass. I love me some box wine, but another great option for smaller servings is Oak Leaf. This is Walmart’s house brand and it is always under $3 per bottle. I bought a bottle for everyone in my office for Xmas. Spent less than $30 total and I looked like a freakin’ hero! Kul att det finns fler svenskar som läser den här bloggen. (translation: Hello Mattias, Fun that there are more swedes that read this blogg). What are your thoughts on cheap farm labor that makes food & wine possible at prices this cheap? I just came back from a dinner where the hosts were avid wine drinkers and we brought a Bota Box (merlot) with a corresponding $30 merlot bottle. To everyone’s surprise I did a blind test with the hosts: one preferred the boxed wine, while the other couldn’t tell the difference! I had a separate friend bring a Bota Box cabernet (since the merlot was such a big hit), and everyone was very impressed: it was the talk of the party. I for one won’t buy a bottle of a wine ever again, unless it costs less than $4 :-). Note that one way to make good wine taste better is to decant your wine. Getting some oxygen into the wine does the world of good. Get your decanters from charity shops. Also, by using a decanter you could trick the wine snobs into thinking you are using bottled wine. Thanks for the recommendation – we *are* wine snobs and won’t be changing – but we go through a bottle maybe once a month. However, my mother has been drinking the corbett canyon box swill – so maybe we should get her to step it up – if for no other reason than when we come over for a visit! The problem with the box is that you can’t see how much is left, or how much you’ve drank. As a somewhat lush, this was problematic. If you just have a bottle, you have to stop when it’s empty or buy/open a new one .. but having another glass from the box, is oh-so-easy. I finished that bota box way too fast … so I just stick to the cheap bottles. I can’t really say much about the white since the wife and I don’t really like the whites much unless we’re making sangrea for an event, but when we do we use their “Wine for Chilling”. By the way we’ve always called it “milking the blood bag” when we gotta squeeze the last few drops from the bag. And I don’t recall where but I’ve seen plans to modify the bags into camel backs for hiking and the such. Though i can’t find the actual winery, this is called “Out of the Box”. It’s the first single-estate, higher end, boxed wine. It ends up retailing for between $16 and $21 per 5 liter box. (that’s 6.5 bottles) Even here in NYC it’s only $20 at the local wine shop. (at my price that’s $3.07 per bottle – even cheaper than the Bota Box) I was initially skeptical, but it turns out to be better than any boxed wine we’ve had and better than plenty of bottled wines as well. Be thankful you’re not living in British Columbia (although I’m sure you got a taste of the Canadian system through the LCBO…). I work in a wine store as my side hussle and we are on the government monopoly system up here. Despite working in a ‘private’ store, we buy all our stock through the government distribution system. It’ll be a LONG time (if ever) we see wine and beer in the grocery stores here. Definitely agree though that there are some good deals to be had for boxed wine. Not just for your alcoholic aunt anymore indeed! I like Target’s Wine Cube brand too. Small and large boxes available. I’ve got the Cab cube now. The Pinot Grigio is nice for summer. I just found the Bota Box at my neighborhood Food Lion….wasn’t even looking for it, as I didn’t realize they carried it there! It’s chilling now in the fridge (pinot grigio). After tax it was still less than $20. Thanks MMM! Love the Bota Boxes, but I can’t seem to find Banrock Station boxes any where. Any hints? You’re missing the real killer app here: Cooking. Wine is not for drinking every day, but it is for cooking every day. Many recipes call for ridiculus things like 2 tablespoons of wine, which just doesn’t work if you’re buying bottles of wine. These boxes though, or better yet Franzia at 10$ per box, provide a years supply of cooking wine at a smaller fraction of the price than even the comparison by volume reveals, because the box really does last the whole year for cooking purposes. This does increase use in cooking, since it’s always available, but it’s essentially a 0 cost ingredient at 10$ / year. Definitely check into making your own wine. I’ve made maybe a half dozen “hobo wines” as I like to call them, and most have turned out fairly well. Friends and family drink them (well, some of them). If you’re a wine snob you might turn up your nose, but for the price you can’t beat it. I’ve got a lil’ over 2 gallons fermenting as we speak that cost under $10. I guess I’m a wine snob. Decided to try a box of the Bota Shiraz, and I can definitely say that it is a league away from the normal bottles I get. With a bit of searching, you can find some superior wines for the same $10-$20 price range that typically represents a moderate/mediocre wine. The Bota did not stand up to those. That said, it was good enough to make it a drink-a-glass-with-dinner-whenever-that-sounds-good selection, which will be a nice change from having to find a night where I can finish off a whole bottle. There were some selections of slightly higher priced boxes that I plan to try in a month or two, after the Bota is exhausted. Keep a look out for New Age if you want to give glass another chance. A good sparkling white and if you pay 7 a bottle you paid too much. Probably not the cheapest, but I love our 1 liter Bandit Wine Boxes for backpacking….Pretty damn good wine. I don’t think they are as cheap as the Bota box, but are about $10 for a box that is larger than a bottle of wine, and it sure puts up with the beatings I put it through in the back country…. Over here in Ontario, Canada, the best way to get cheap wine that’s acceptable is to have a store make it for you. The do-it-yourself wine stores actually do most of the labour for you, so you can get $4+/bottle wine (less if you’re doing fruit wines). Some of them are quite good.